These ten simple make and take salads are perfect to throw together when you’re invited to a holiday party and you’re supposed to bring a salad. Sure, you can always make a green salad, but each of these vegetable salads are simple and delicious. We love each of these recipes, and even if you don’t have a lot of kitchen skills, these recipes are pretty much fool proof. The best part of these recipes is that, with the exception of the cucumber and tomato salads, these simple can be made the day before. Unlike a traditional lettuce salad, these recipes become more flavorful if they’re allowed to marinate in their dressing overnight in the refrigerator. A lettuce salad will become soggy. Which of these ten simple make and take salads will be your favorite? 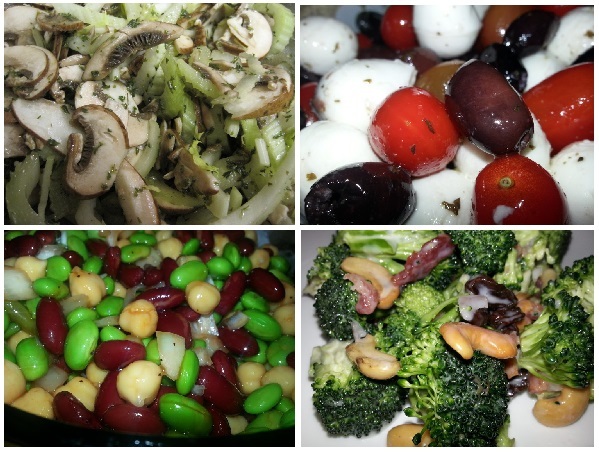 These salads are listed in the order in which they were published on Patty Cake’s Pantry. Celery is a flavor that’s associated with Autumn and Winter holidays, so this salad is the perfect accompaniment to a holiday meal. The combination of the celery and the citrus vinaigrette make this salad light and refreshing. It is a welcome addition to a holiday table that can be loaded with very heavy foods. The earthiness of the mushrooms provides the perfect counterpoint to the celery and lemon vinaigrette. Celery is inexpensive and readily available all year long, so Lemony Celery Salad has become a favorite side salad around here because it’s simple to prepare. Three Bean Salad appears on almost every salad bar I’ve ever visited, and purchasing this salad from the deli, or in jars from your local warehouse store can be expensive. This is a very simple salad to prepare, and your friends and family will be impressed with your culinary skills. It’s also fairly inexpensive to prepare. It seems like most of my friends love beans as much as I do, so this recipe is always well received. This salad was originally supposed to be prepared with black beans, but I discovered there were no canned black beans in the house. 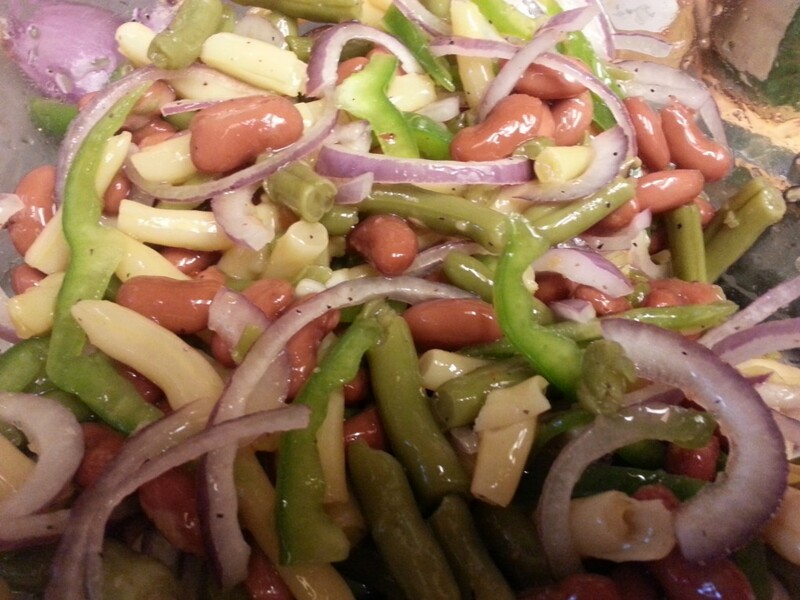 Fortunately, there were kidney beans, and Corn and Kidney Bean Salad was born. This can be served either as a salad or as an appetizer. It’s delicious scooped with tortilla chips or scooped with a fork. If you don’t like kidney beans, follow the recipe and substitute an equal amount black beans, cannelini beans, or great northern beans. 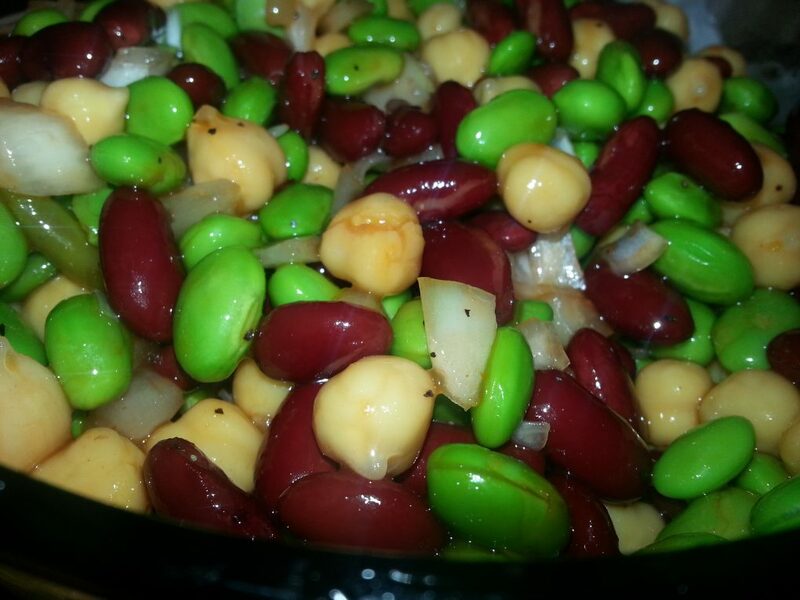 I’ve even made this salad using navy beans. 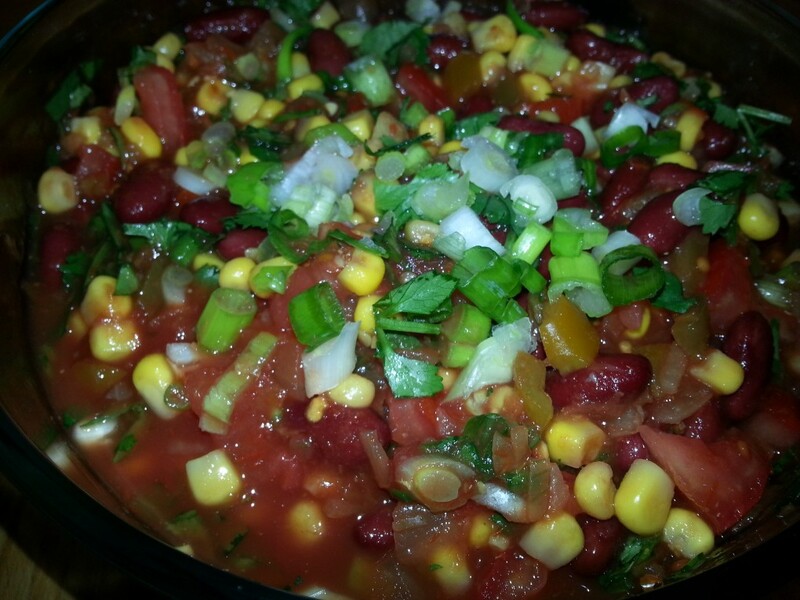 Corn and Kidney Bean Salad will bring the flavor of the Southwest to your holiday table. Bean salads are so simple to prepare, and this Sweet and Sour Bean Salad is no different. This salad tastes better the longer it marinates, but it’s good served immediately, too. 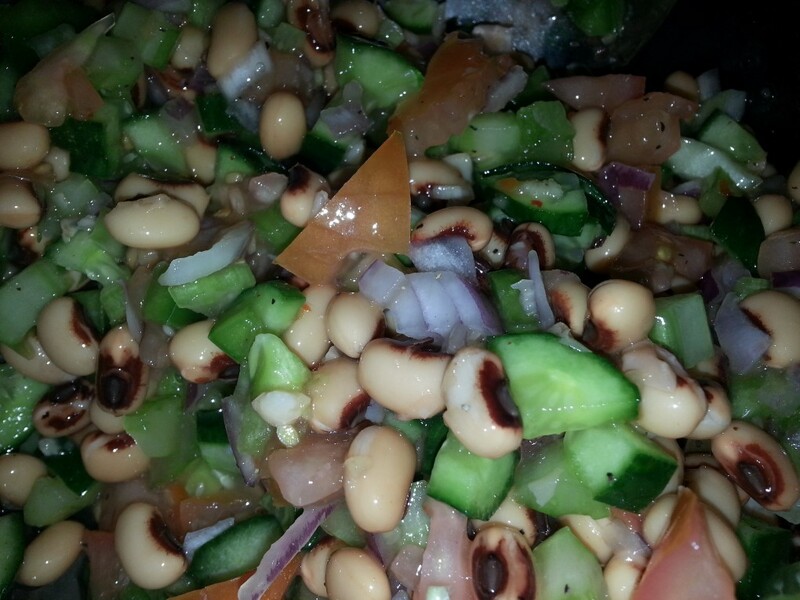 Texas Caviar is also called Black Eyed Pea Salad, and it’s amazing. It’s a great way to serve black eyed peas to your family. This salad is light and refreshing, but use a gentle hand with the Louisiana Hot Sauce if you’re serving children or people who don’t like heat as it can easily become too spicy. We love Texas Caviar and frequently serve it as a side dish, so why not add it to a holiday table, too? If you’re looking for a salad that has a more Mediterranean flavor, you’ll love this Tomato, Mozzarella, and Olive Salad. This simple salad is loaded with flavor, and we all love it, but my favorite thing about making this salad is that there is absolutely no chopping required to prepare this salad. 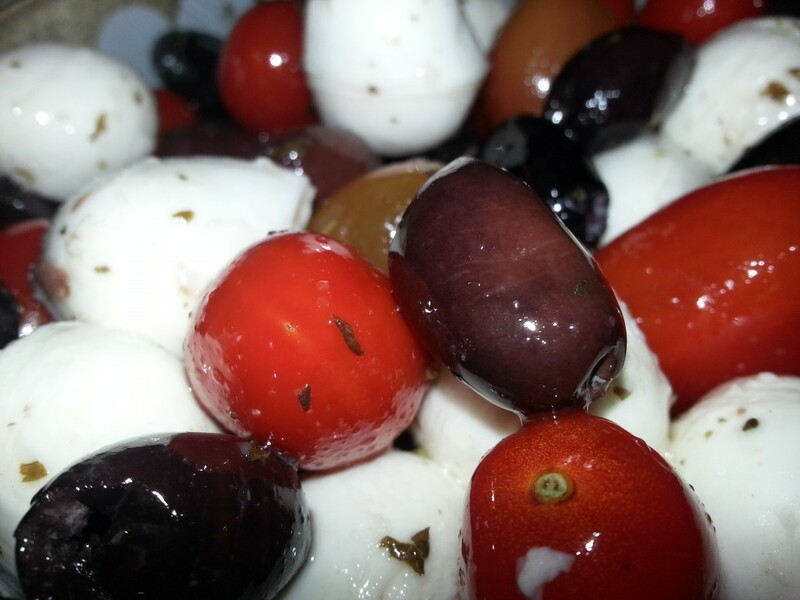 This means it’s very simple to prepare Tomato, Mozzarella, and Olive Salad to take to a potluck or a holiday dinner. Cucumber salads have been a staple in our household for as long as I can remember. My paternal grandmother loved sliced fresh cucumbers on the table for every meal during the summer. This Easy Cucumber Salad is always well received. Even Baker’s Man who isn’t a big fan of tomatoes loves this salad. 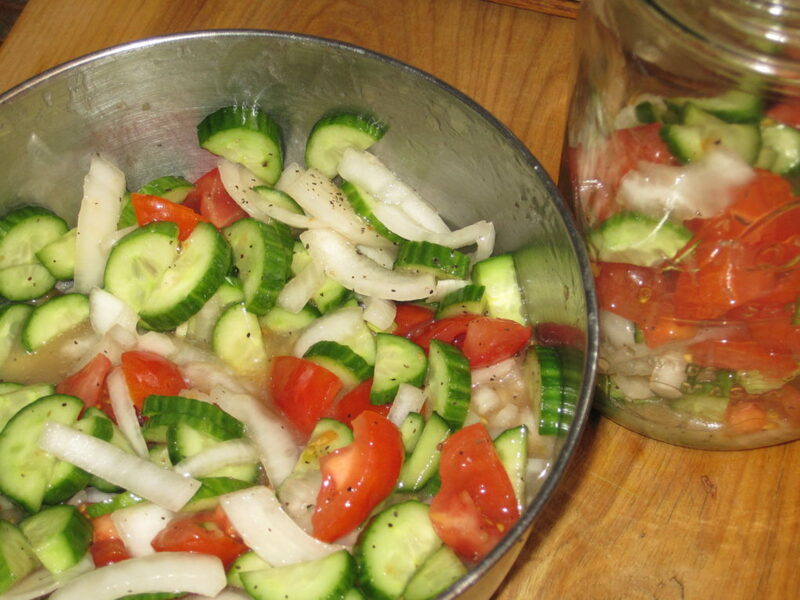 Because the cucumbers weep after they’re cut, this salad is best enjoyed shortly after it’s prepared in order to prevent the dressing from being diluted. If you prefer, you can make it the day before and just be prepared to add extra dressing if needed when it’s served. 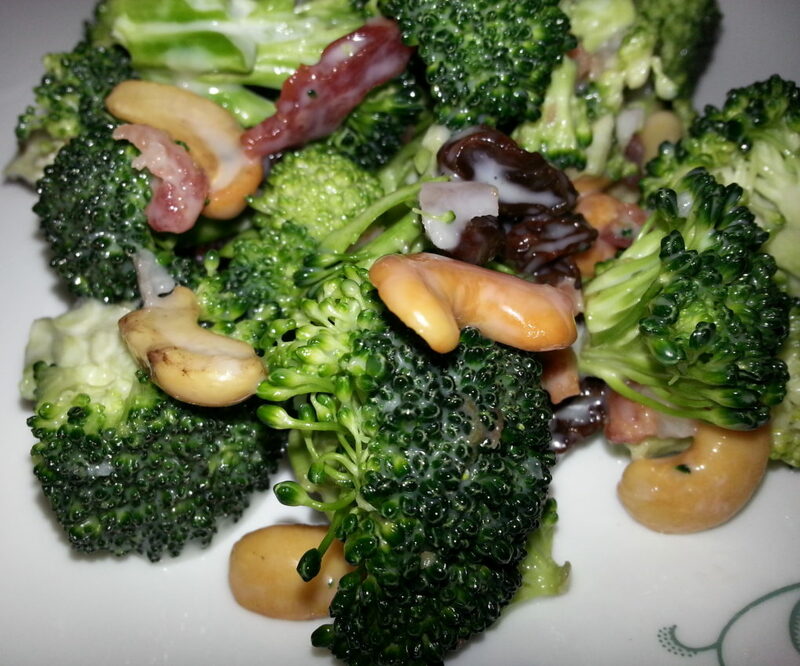 Sue Chef describes this Bacon and Broccoli Salad as one that makes her mouth happy. I’m glad that she likes this salad, because I’ve been in love with it for years. This salad is the perfect side dish for your holiday meal because it doesn’t require any cooking, and we all know how crowded stove tops and ovens become during the holidays. If you’re serving any vegans, simply leave out the bacon and use vegan mayonnaise. Otherwise, follow the recipe. Bacon and Broccoli Salad is still very tasty, even without the Bacon. Cucumber, Tomato, and Feta Salad contains similar ingredients to the Easy Cucumber Salad above, but it is dressed with a homemade, red wine vinaigrette. The feta adds saltiness and another depth of flavor to the salad, and I always think of this as the more “gourmet” version of our usual cucumber salad. To make serving this dish easier, I layer the ingredients in a bowl, and dress it just before tossing everything together just before serving time. cucumber, Tomato, and Feta Salad is always a big hit with our friends and family. I have been in love with pea salad for years. 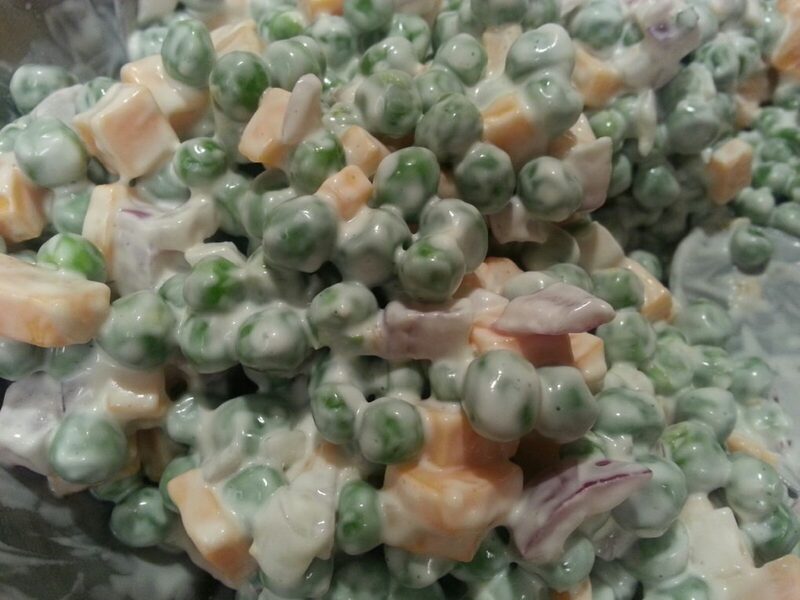 This recipe for Simple Pea Salad is so good that I think of it as a special occasion recipe, and this is from a woman who doesn’t really like peas unless they’re in soup or pasta. Peas are a traditional side dish in some homes, and this salad lets you have your peas without taking up any space on top of the already crowded stove top. I had already made my list of Ten Make and Take Salads when I remembered that there’s one other simple, and healthy salad that we love here at Patty Cake’s Pantry. I realize that this salad is supposed to be prepared in a mason jar, but you can easily assemble it in a bowl or 9X13 casserole dish. 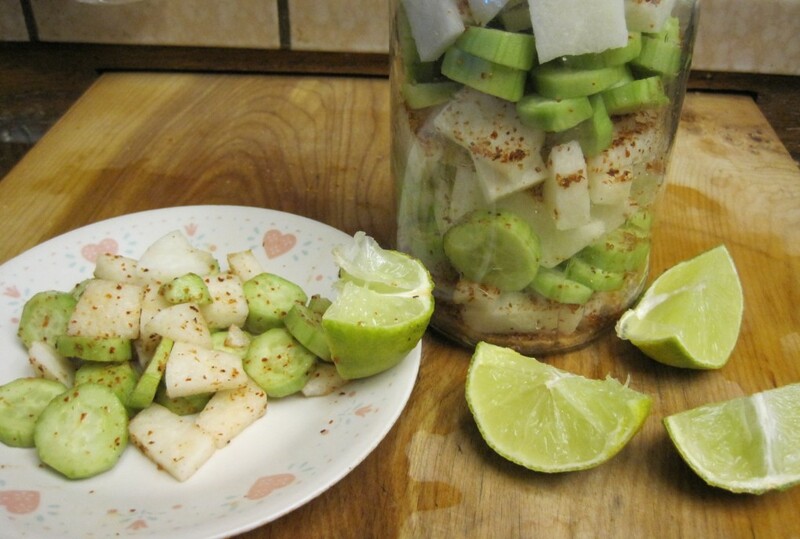 The combination of the cucumber, jicama, chile seasoning, and lime juice is amazing, and it’s very simple to prepare. Plus its friendly for your waistline. A friend on WW tells me that this salad is 0 points, so those watching their weight might appreciate this on the holiday table. Cucumber Jicama Salad is a simple, but flavorful salad that I’m sure you’ll love as much as we do. That’s our list of simple make and take salads for holiday gatherings. Give one or all of them a try and let us know which one is your favorite by leaving a comment below. What an excellent roundup of salads for the upcoming picnic / potluck season. Thanks for the salad inspiration! Nancy, a friend at work actually inspired the post because her family asked her to bring a “different” kind of salad for Thannksgiving Dinner. I collected these recipes for her to have some choices. I think you’re right, though. 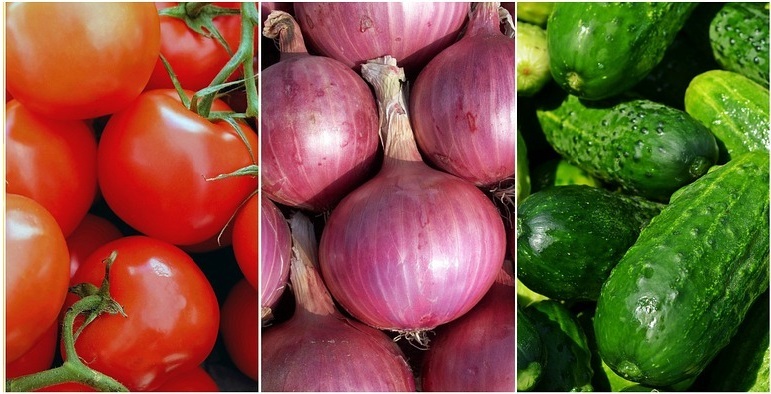 All of these make a great side for grilling season. They all sound so good! I’ll just have to try them all! I hope you really do try them all. Let me know which one is your favorite. Love every option given to making these delicious Salads. I love salads any day for Dinner. These salads look delicious, crunchy and colorful. Veena, I love salads, too, but I get bored easily. These recipes allow us to have some variety in our menu. that broccoli and bacon salad has my name all over it. great collection of salad recipes here! Danielle, that’s one of my favorites, too. I’m so glad that you like these recipes. Let us know which one of these is your favorite. Salads on the go are the best..great variety and suggestions here! I love salads that I can make ahead of time and take to a friend’s house or potluck or eve a holiday dinner at someone else’s house. It really helps decrease stress on the day of the event. Thanks for so many great ideas! With the spring finally here, I’m definitely in salad mode. I am in salad mode on the days it actually feels like Spring. Our weather had been seriously bipolar. One day I’m in short sleeves and two days later, I’m back to sporting a parka. I love having things ready in m fridge to grab and go. Thanks for sharing your wonderful ideas. Anne, I agree with you. Having things ready and in the fridge make it so much easier to get dinner on the table, and it helps keep me from stopping for fast food and ruining both my budget and my diet. Woot! With sunny days ahead, I’m all about fresh produce and salad is my favorite go-to lunch or dinner. Love all these roundups! I love salads for lunch, too. We love grilling and side salads for dinner when the Summer heat arrives. We have one month of temperatures over 100 every day. That’s one of the reasons why I came up with this salad collection. I always tended to make the same ones, too. That’s one reason why I began to expand my salad repertoire with these. The pea salad is my favorite, too. I have even made it with canned peas when I’m out of frozen. Let me know which one becomes your favorite. I love salads…there are so many different kinds that they never get boring! With warmer weather just around the corner here in Atlantic Canada, these will be perfect for picnics! 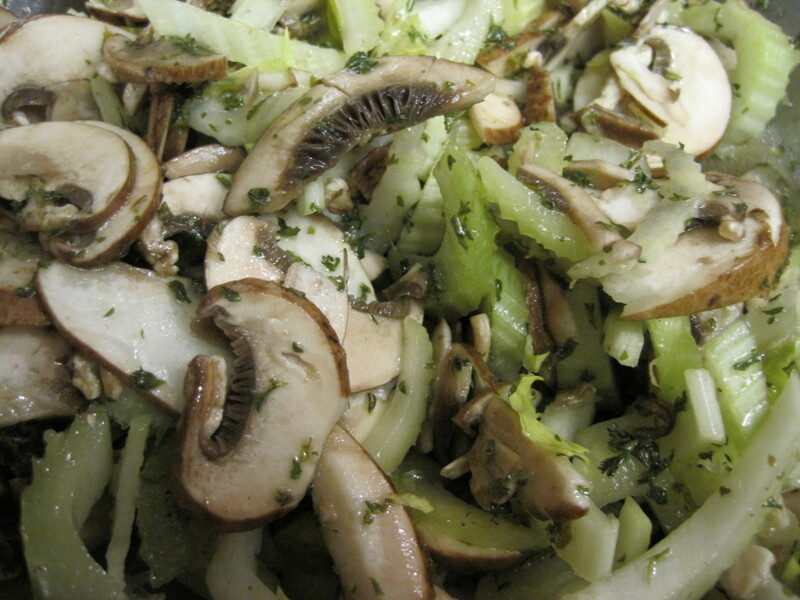 In warmer weather, I really enjoy salads like the celery and mushroom combination because there’s no mayonnaise, so you don’t have to worry as much about spoilage if your picnic goes longer than anticipated. This salad collection is a great go-to for spring & summer cookout season. Easy and delicious and always ready to please a crowd. That’s what I love about each of these salads. I can make them the day before, and they pair perfectly with whatever we are grilling. They’re a nice break from the usual macaroni and potato salads, too. This is so perfect for the upcoming BBQ/picnic season! I always struggle with what to bring as a side; these are all great choices! Julie, that’s exactly the problem I had when I was invited for a barbecue. I’m still perfecting my macaroni salad, but I have a good potato salad. The problem is that if someone else was also told to bring along a salad, they will usually bring either potato or macaroni salad. I like that I can bring something a little different. Sometimes, people request one of these salads. The Lemony Celery, pea, and broccoli salads are the one’s that are most often requested by my friends and neighbors. About salads especially this time of the year! Thank you for sharing so many amazing recipes will try them soon! Andrea, we have a joke here that when the weather gets warm, our food gets colder. Last night, I made crab salad for dinner, and Sue Chef asked if it was Summer already. Come back and let us know which of the recipes is your favorite.